This article will demonstrate how to solve Socket Error 10060, an issue known to occur on computers running multiple different versions of the Windows operating system. This error is encountered while attempting to connect to the web, as for example when the system can’t connect to the ISP mail server in the required time period. How to identify Socket Error 10060 on your system? First things first: how do you know you’re dealing with Socket Error 10060? There are some things you can look for in order to recognize this very problem. 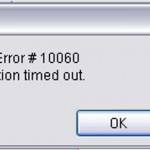 A variation of the error message displayed above is “10060 – Connection timeout,” which basically tells you of the same problem. Finally, there’s one more message which again accompanies the same issue, but this time takes on a totally different form, and that’s “HTTP Error 404404 Not Found”. In this case, the server fails to obtain the file or the script you’ve asked for. At first, you can try either refreshing the page or checking to see if you’ve entered the right URL – it’s usually as simple as that. If, however, this isn’t enough to get around the problem, you should talk to their system Admnistrator about it. As we’ve mentioned before, this error is usually encountered due to the fact that you are using a proxy server and there isn’t enough time for the connection to load the web page. This, in turn, causes the connection to timeout. Since Socket Error 10060 is related to the time it takes your browser to load a particular web page, one thing you could do in order to fix the issue is to increase the time limit it takes the proxy service to load said web page. If you’ve never done that and have no idea where to start, fear not – we’re here to help! Follow the guide we are about to outline and you should be able to achieve the task in no time. Go to Start, then Run, and type “regedit” followed by clicking OK.
Once you’ve selected that, click on RequestTimeoutSecs and then click the Modify button. Click on the Decimal and modify the figure for the webpage loading time. If you’re unsure what the value should be, we suggest at least 180. Once again hit the OK button and then restart your computer to complete the process. With this, the connection timeout problem should be fixed. If you’re still getting the same error even after following these steps, try increasing webpage loading time figure to at least 300. We hope this post helped you solve the problems caused by this error. If it did, we’d love to hear about it in the comments. If it didn’t, and you know a better way to fix the issue, we’d like to hear that even more! You all have the same area in the registry (W3Proxy) that is to be corrected. Since I have looked for it at least 20 times and not found it I don’t believe this will work for Windows10, Does anybody an answer for an OS later than Windows XP? If so it sure would be nice to know it.